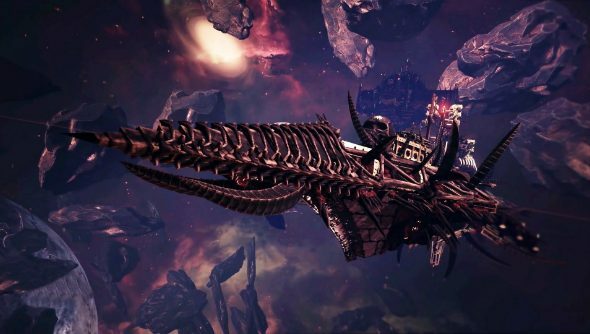 The latest Warhammer game to arrive on the shelves of Steam’s vast repo of other Warhammer games is Battlefleet Gothic: Armada. Want some other games to fill the dark void of your hard drive? Here are the best space games on PC. Set in the deep space of Warhammer’s 40K universe, Armada is an RTS for naval commanders looking to take the helm of several mile-long spaceships adorned with skulls in battles against a range of races from the tabletop series. A singleplayer campaign with RPG progression elements and a multiplayer for up to 2v2 battles that take place on a 2-dimensional slice of space to save your human brains from attempting to comprehend the complexities of grand orkish space warfare. It’s been getting decent reviews so if Warhammer 40K and space strategy are your bag, have a look at the flashy trailer below for any further convincing you might need.